In 2006, retired former El Paso Buzzards professional hockey player Cory Herman founded the El Paso Rhinos. The Buzzards had ceased operations in 2003 and Herman wanted to bring ice hockey back to the city of El Paso. With the support of his family and former Buzzard patrons, the team began their first season as a Junior B team. 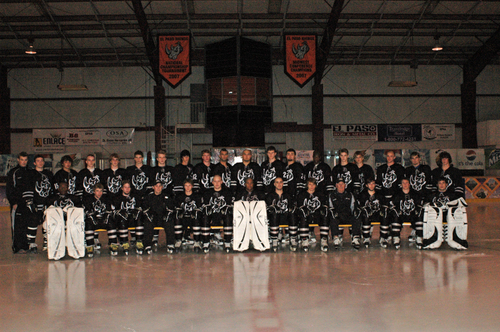 With its debut as a WSHL team, the franchise’s first regular season was a winning one. Many Rhinos players found success in higher levels of ice hockey after their first successful bästa online casino season in El Paso. Early Rhinos alums like Tad Norris, Corey Jendras, Zach Jaraczewski, and Derrick Brennan all moved on to have stellar seasons in higher junior leagues and even college hockey. Naturally, El Paso’s 2007-2008 looked promising with the new Junior ‘A’ status under their belt. Finishing fifth in the overall standings, Rhinos player Marcus Wilhite turned in a 46 goal, 109 point season to lead the Mid-West Division of the WSHL in scoring. In turn, El Paso’s early success attracted higher-level talent. The team acquired new talent in players like Anthony Paulsen, who led his previous league in scoring among all defenseman, scoring 6 goals and 18 assists in 38 MJHL games. With talent and determination to boot, the Rhinos finished the 2007-2008 season with only 1 loss in regulation, giving them 98 point. As fate, or perhaps talent, would have it, the Rhinos faced off against the Phoenix Polar Bears in the WSHL championship after sweeping the Rampage for the Mid-West Division Champion title. Ultimately, the Rhinos defeated the Polar Bears and earned the right to hoist the 2008 Thorne Cup. Hungry for a chance to defend their Thorne Cup title, the Rhinos re-signed Nick Gorup, Zach Hale, Austin Balko, Zach Kohn, Jeffrey Schmudlach, Bill Krueger, Arthur Hollinger, Eric LaBounty, Kevin Davis and Zach Goller. In addition, they signed forwards Braxton Green and William Gillis along with Maryland defenseman, David Fegler. The organization then turned to the Midwest to acquire new players. The Rhinos signed the talented Wisconsin trio of Anthony Knuth, Trevor Erickson and Michael Bottchner. Michiganders Drew Montague, Eben Crandall, Andrew Duff and Tyler Benson followed suit, arriving in El Paso eager to start the season. The Rhinos had a hot start to the 2008-2009 season, winning 11 straight games before meeting a familiar foe in the Tulsa Rampage. After a close 6-5 loss, the El Paso team posted a record of 11-1-0 and 22 points. The Rhinos found redemption near the end of first half of the season, as they were back on top of the Rampage in the standings. El Paso posted a mid-season record of 25-1-1 with 51 points, while Tulsa was second in the division with 43 points and a record of 21-8-1. Following a Thorne Cup season with more winning in the first half of the season, the Rhinos had a nearly unbeatable pride. Unexpectedly, that pride grew when Karrie Kern, Chief Executive Officer of the United States operations branch of the Zimbabwe Conservation Task Force took in a Rhinos game. 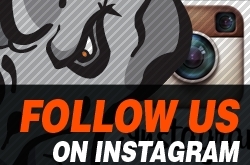 Admiring the picture of the rhino on the bodywork of the team bus, she jokingly suggested the El Paso Rhinos adopt Tatenda, an actual rhino in Africa, as a mascot. The organization followed through on Kern’s suggestion and adopted the male rhino in 2008. Though he was not physically moved to America, the organization continues to donate to the organization to cover Tatenda’s food and upkeep expenses. After the holiday break, the Rhinos returned to the ice with their new good luck charm Tatenda in their hearts. Tatenda’s spirit lifted the team to play an entire month without defeat. The players closed January by wearing pink jerseys that would be auctioned off, with all of the proceeds going to the Susan G. Komen Foundation. Good will produced good luck and the team skated by all of its competitors throughout the rest of the season. On March 8, 2009, El Paso became the Mid-West Division Champions for the third time in three years, beating San Antonio, 9-3, to sweep the Diablos out of the Western States Hockey League playoffs. Head coach Cory Herman also earned a monumental achievement, earning his 150th win in only three seasons at the helm. With another winning season in the books, the Rhinos represented the Western States Hockey League at the Tier III Junior ‘A’ Hockey Nationals in Marlboro, MA. 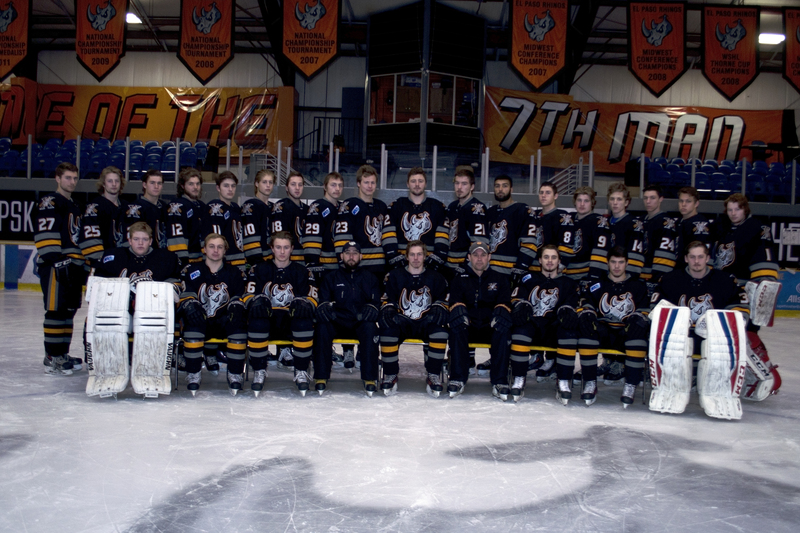 Although the team was unable to defend the Cup, the new franchise had inarguably made a name for itself in the WSHL after two consecutive National Tournament berths. At the conclusion of the season, the junior hockey careers of Nick Gorup, Bill Krueger, Arthur Hollinger, Eric LaBounty, Jeffrey Schmudlach, Zach Goller, Kevin Davis, Andreas Bengtsson, Adam Rosenberg, Shane Callahan had also come to an end. Arthur Hollinger, Bill Krueger, Jeffrey Schmudlach, and Nick Gorup went on to sign with various college hockey teams around the country, motivated by their previous success with the Rhinos. In an effort to maintain the influx of ice hockey talent, the Rhinos organization increased their recruiting staff to five just before the 2009- 2010 season. Player Personnel Director Trevor Converse oversaw the 5 man staff, which included Lou Fritz, Mike Young, Bret Norris and Lou Gravel. 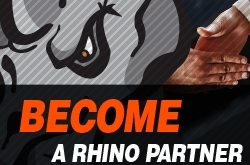 The Rhinos also made proactive efforts to improve the way their players lived and trained. 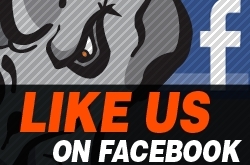 In June of 2010, the franchise opened the El Paso Rhinos Training Center. The hockey specific gym contains state of the art equipment, including "The EDGE" Skating Treadmill, which allows players to skate on an ice-like treadmill, as well as the TOUCHEYE™ Video Analysis System, which provides immediate video response during training sessions. 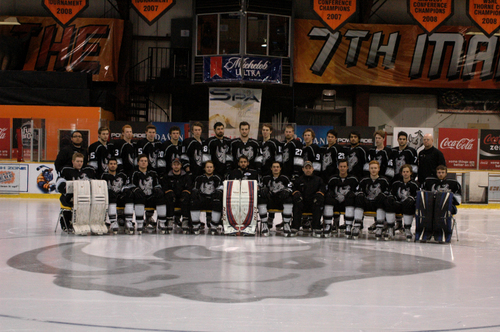 With the new training facility as a bonus, numerous players signed with the Rhinos for the upcoming 2010-2011 season. With the brand new state-of-the-art training facility as a bonus, Shapiro, Benson, Ridgedell, Posillico, Bohn, Poland, Henne, and Wallace re-signed with the Rhinos. The organization also welcomed four new forwards, Moco Willis, Todd Thomas, Chip Callahan as well as goaltender Matt Tyler and defenseman Oliver Williams. Attempting to avoid a repeat of the 2009- 2010 season opener, the Rhinos sought revenge on the defending Mid-West Division Champions, the Boulder Bison. El Paso started the series with a win, which was unfortunately followed by two losses. Despite a tougher beginning to the season than previous years, the team remained committed to the community and returned home to wear a special Boy Scout jersey. The sweaters were auctioned off with all of the proceeds benefitting the local Boy Scout association. Just over a month later, the Rhinos replicated the auction with military jerseys during a home series that the organization named “Military Appreciation Weekend.” All active soldiers and their families were given free tickets, with two military hockey games played during second period intermissions. Making their participation annual, the Rhinos again collaborated with “Toys 4 Tots” to collect toys for children. The franchise also auctioned off law enforcement jerseys that commemorated the annual El Paso “Guns and Hoses” baseball game. Additionally, the players and staff collected money and shaved their heads for St. Baldrick’s. The Rhinos continued to gain prevalence on the ice as well as off the ice. 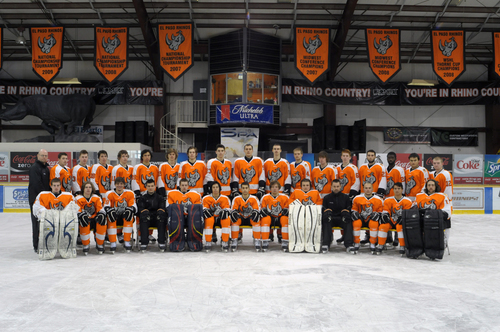 Because of their success, the team was featured monthly in the USA Junior Hockey Magazine 2011 edition. Before heading into the post-season, the team and franchise saw their hard work pay off when they unveiled a brand new team bus on March 27, 2011. The team hopped on the bus to travel to Minnesota where they competed in the National Tournament. The Rhinos’ first game ended in a tie with the Granite City Lumberjacks. With wins over the Northern Cyclones and the Chicago Hitmen, El Paso earned a spot in the junior hockey version of the Final Four. Allowing only one goal, netminder Trent Casper led the Rhinos to a win over the Idaho Steelheads, acquiring a berth to the Tier III Junior ‘A’ national championship game with a hard-fought 2-1 win in Rochester, Minnesota. 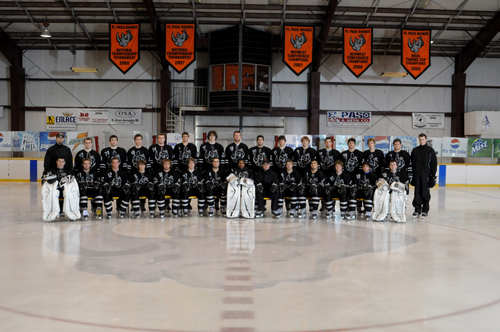 The team was then set to face off against the Helena Bighorn in the national championship game. On their fifth straight day of hockey, the Rhinos faced a 1-0 deficit just after 54 seconds of play against the Bighorn. Helena was able to maintain their lead and the Rhinos were stopped just one game short of their goal. However, the season of hard work and dedication was rewarded when the team returned to El Paso with silver medals in hand. With the 2011- 2012 season off to a good start, the franchise received great news: the Rhinos had received the bid to host the Thorne Cup Championship. Seemingly in celebration, the Rhinos scored a whopping 40 goals in the three game series following the announcement. After weathering a tough set of games at the mid-season WSHL showcase, the Rhinos were eager to get back to their winning ways. El Paso posted incredible numbers during the second half of the 2011- 2012 season, until the series just before the playoffs. The Rhinos lost the first two games to the Dallas Ice Jets but salvaged the last game to win 6-2. Regardless, the Rhinos headed into playoffs with enough confidence to win the first series against the New Mexico Renegades. They were then forced to settle the score with the Dallas Ice Jets for the division title. Scoring eight points in best of three series, the Rhinos had secured their place in the Thorne Cup Championship playoffs. El Paso and Dallas met again later in the playoffs but the second time around did not produce the same outcome. The Ice Jets captured two wins immediately and claimed their spot in the Thorne Cup Championship game. Avoiding ending the season with a loss, the Rhinos earned a victory over the Fresno Monsters for third place. Although the season had a successful ending, the 2012-2013 team would be without crucial point scorers in goaltender Trent Caspar, ranked eleventh in the league in goals against average, and Trey Hughes, who finished tied for twenty-first in league scoring. Hughes signed with the Twin City Steel, a Minnesotan team in the North American Tier III Hockey League. Kyle Stephens left El Paso to attend Minot University where his team won the American College Hockey Association Men’s Division I Championship. The 2012-2013 season marked El Paso’s first season in the Mountain Conference. Regardless of new opponents, the Rhinos were able to clinch their conference. 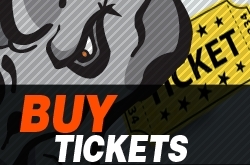 By the end of the 2012-2013 season, the Rhinos had broken all franchise attendance records, setting new records for the most sold out crowds in one season, largest crowd in a season and overall total attendance for the year. Many players from the 2012-2013 roster graduated to higher leagues at season’s end. Rhinos tough guy John Morales signed with the English River Miners of the SIJHL. El Paso native and Rhinos captain Michael Rivera went on to play college hockey at the University of Central Oklahoma. Forwards Tyler Basham and Tommy Malkmus went on to play in the NAHL. Basham joined the NAHL’s Johnstown Tomahawks while Malkmus returned home to North Dakota to play with the NAHL Bismarck Bobcats. 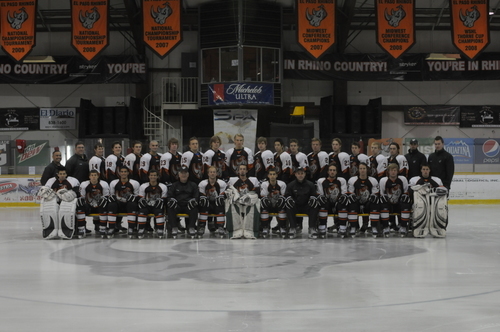 In true Rhino fashion, the team strung together another successful season in 2013-2014, earning a stellar 44-2-0 record. 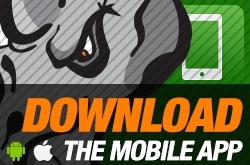 The Rhinos record-breaking season was due in large part to a truly deep roster. Veteran players like David Nelson, Andrew Bradford, Jack Strusz, Chris Wilhite, and Nick Wright returned to the team. Meanwhile, the explosive Plesa brothers line became an offensive machine for the Rhinos, posting a combined 270 points. Forwards Chad Cesarz and Austin Hoff also returned to the Rhinos from NAHL clubs, while defenseman Kalvis Ozols and forwards Eric Baldwin and Drew DePalma were acquired from the San Diego Gulls. Jan Dam, former Rhino and the newest staff member, convinced Jiri Pestuka, another Czech native, to join the El Paso roster late in the season. With these acquisitions and resignings, the Rhinos successfully solidified top-end offensive talent and productive depth. In the crease, the Rhinos acquired two solid goaltenders to make up arguably the most powerful tandem in the WSHL. Herman’s last minute trades allowed for Seattle Totems goalie Bryce Fink to support Vay in the net. At the end of the Rhinos deep postseason run, Fink was named Thorne Cup and National Championship MVP, earning a 6-0 record in the postseason. Fellow Rhinos goaltending acquisition Adam Vay achieved similar success in the regular season, earning a 25-1-0 record and fantastic .936% save percentage. Vay also won all three of his playoff starts, making the Fink-Vay tandem undefeated in the Thorne Cup Playoffs. At season’s end, Vay was rated the number one goalie in the WSHL with the best goals against average, save percentage, and near-perfect regular season record. Rhino staff also contributed mightily to the successful season. Garrett Poland returned as assistant coach while Jan Dam returned to help with hockey operations and European scouting. The city certainly rallied around the team’s success; the Rhinos posted 26 sellouts, good for best attendance in the entire WSHL. As the number one team in the WSHL and arguably all of Tier III junior hockey all season long, the Rhinos took advantage of their regular season momentum by posting an undefeated playoff record (9-0-0) that earned them a trip to the 2014 Thorne Cup Championship. The Rhinos defeated the defending champion Idaho Jr. Steelheads 7-3 in front of a rowdy home crowd to clinch their second Thorne Cup in franchise history. Less than three weeks later, the Rhinos travelled to Las Vegas, Nevada to contend for the National Championship title. After a win over the Jersey Shore Wildcats, the El Paso looked to take on the Idaho Steelheads again. This time, however, their luck ran out as the Steelheads clenched a shutout victory. After correcting their path with two wins over the Soo Firehawks, the Rhinos met the Steelheads for the third time in three weeks. A 7-3 win for El Paso meant that Idaho had been dethroned yet again. David Nelson’s hat trick and Bryce Fink’s goaltending performance helped the Rhinos earn their first National Championship Title in franchise history. In addition to winning three title during the season, the Rhinos played in the franchise's first outdoor game. Clad in vintage throw back jerseys, the Rhinos secured a shutout of the New Mexico Renegades at the Los Alamos Outdoor Rink. Off the ice, the Rhinos made community gains by hosting their fifth annual golf tournament as well as its inaugural Vern Jhondro Memorial Rhino Run. At the end of the season, Drew DePalma, Chad Cesarz, Austin Hoff, and Chris Wilhite, and Jack Strusz committed to play for St. Mary’s. Dakota Beaulieu signed to Worcester State in Massachusetts and Bryce Fink committed to play at the University of Wisconsin Superior. Defenseman Kalvis Ozols joined the professional ranks as he travels home to Europe to play for the Mont-Blanc Yetis. Tom Bartel also moved on to play collegiate hockey as he signed with Hamline University. 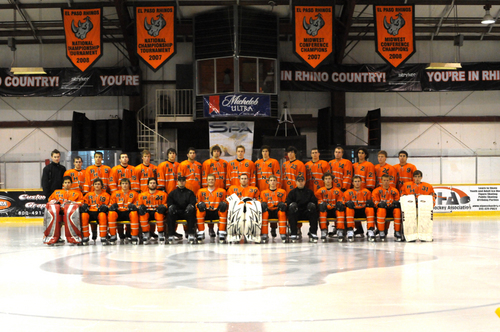 The El Paso Rhinos – 2013-14 Thorne Cup Champions – put together another fantastic season in 2014-15. The team finished with 82 points for the season with a 41-5 record. The Rhinos were a decidedly defensive team in 14-15, allowing only 95 goals during the regular season – ranking them third in the league as one of only three teams in double digit goals allowed. Goaltender Adam Vay started 32 games out of 46 regular season games for the Rhinos and posted a stellar 2.03 goals against average and a 0.923 save percentage. Vay was responsible for closing the door at the goal line but, several defenders did their part in making sure that opposing players never even got near Vay. Defenseman Robert Horak led all defensive players in games played – with 42 – and was a stalwart in the Rhinos’ starting lineup. Defenseman Patrik Stancl – also from Czech Republic, like Horak – played 41 games and was also a key to shutting dowwn opposing offenses. Angel Sanca appeared in 34 games defending the blue line as well. Sanca ended the season with an amazingly low eight penalty minutes in those 34 games. Defenseman Brennan Johnsson joined the Rhinos at the trade deadline from the Phoenix Knights and not only helped to secure the blue line but, Johnsson also added nine points in just six regular season games in the orange and black. Just because the Rhinos defense was among the league’s best, it does not mean that the offense was anything for opposing teams to take lightly. In fact, the Rhinos also ranked third in the league in goals scored with 279. It would be impossible to discuss the Rhinos prolific offense without first mentioning yet another Czech player – forward Jiri Pestuka. Pestuka ended the season tied for third in the league in goals with 41. Defenseman David Brancik – and Pestuka’s fellow Czech and roommate – was not to be outdone when it came to scoring. Brancik led all WSHL defenseman with 49 points. Brancik’s total was two points ahead of fellow Rhino Johnsson, who did most of his scoring with Phoenix. A large amount of Pestuka and Brancik’s goals came from the stick of Swedish forward Sebastian Borg. Borg’s 74 points – most of which came from his 50 assists – ranked him ninth in the league. Pestuka was just ahead of Borg with 76 points. Pittsburgh’s Bryton Tomko and Czech forward Marek Langhammer both contributed over 40 points to the team’s amazing offensive numbers. Forward and fan favorite Gavin Abbott secured 38 points for his team during the regular season. Forwards Lukas Znosko and Jordan Cullum -- Cullum was also added late in the season from Phoenix – contributed mightily to the cause, as well. In December, the Rhinos headed to Las Vegas – with a 19-2 record in tow – to face-off in the WSHL’s 14th annual Western States Shootout. The Rhinos hit the road back to El Paso with yet another championship in tow. The team beat the Idaho Jr. Steelheads 4-3 in double overtime in the final game of the round robin showcase tournament. The Rhinos and Steelheads would match up again in mid-April with a much different result. 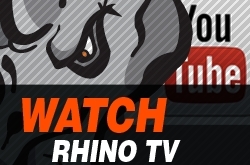 The Rhinos began the Thorne Cup Playoffs with a two game sweep of the Dallas Snipers. The next weekend saw the Oklahoma City Blazers roll into El Paso in order to continue what has become a burgeoning rivalry. After losing game one in overtime, the Rhinos stepped it up and defeated the Blazers 8-2 and 8-1 in the next two games. El Paso then swept the Ogden Mustangs in order to secure the conference championship and guarantee a shot at defending their Thorne Cup Championship. The first game was at the Sierra Providence Events Center, after the Steeleheads – who possessed the better record – chose to have the final game three games in Idaho. The Steelheads – who finished four points ahead of the Rhinos during the regular season with 86 – jumped out to a three goal lead in front of a capacity crowd after only eight minutes. Midway through the first period, Pestuka netted a goal to head into the first intermission at 3-1. The Rhinos used that momentum to continue to score on the Steelheads and netted three more goals in the second period. The game would end as a 4-3 Rhinos victory. Unfortunately, the Rhinos were not able to harness the first game magic in order to repeat as Thorne Cup champions. Idaho won the next game in El Paso and the following three games in Idaho in order to secure the Thorne Cup Championship. The Rhinos were once again active in the community, visiting local schools and participating once again in St. Baldrick’s Day festivities. The entire team and coaching staff shaved their head in support of St. Baldrick’s Day. Fans were able to bid money in order to shave a player’s head. All proceeds were donated to the St. Baldrick’s Foundation. Despite coming up just short at the end of the season, 2014-15 was a successful season for the Rhinos yet again. The players all contributed in some way in the community and on the ice. The team sold out almost every game and is looking to once again put an outstanding team on the ice next season. 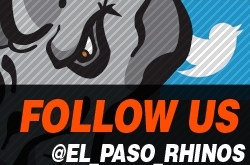 The Thorne Cup will always be the goal for any El Paso Rhinos team and next year will undoubtedly feature yet another outstanding team – and a strong push for El Paso’s most successful franchise. Before the 2015-2016 season started, the Rhinos’ year got off to a great start when the Western States Hockey League (WSHL) announced the League’s move to Tier II. Now on par with the North American Hockey League (NAHL), the WSHL would be able to recruit more skilled and talented players, increasing the caliber of play throughout the League. Former Rhino netminder Adam Vay evidenced the WSHL’s already elite level of play when he signed with the Minnesota Wild just four days before the WSHL’s announcement. The 6’5 Hungary native earned an entry-level contract with the NHL team after he posted a 3.67 GAA and a .911 SV% in three games for Team Hungary at the 2016 IIHF World Championship in Russia. When the Wild announced his signing, they reported that Vay went 28-4-0 with a 2.03 GAA, a .923 SV% and five shutouts in 32 games with the El Paso Rhinos in the Western States Hockey League (WSHL) in 2014-15. He ranked T-1st in the league in shutouts, third in SV% and fourth in GAA as the Rhinos advanced to the Thorne Cup Final. Vay went 25-1-0 in 26 games with El Paso in 2013-14 and led the WSHL with a 1.76 GAA, a .936 SV% and ranked T-1st with five shutouts as the Rhinos won the 2014 Thorne Cup and National Championship. Additionally, former Rhinos Matthew, Nicholas and Peter Plesa – key members of the 2014 championship team – were all invited to the New York Rangers Prospect Development Camp over the summer. Building upon nine winning seasons since 2006, a place in a higher-level league, and an alumnus signed to the NHL, the Rhinos franchise prepared to celebrate its ten-year anniversary during the 2015-2016 season. El Paso welcomed back Bryton Tomko, who posted 50 points in his first season in El Paso, goalie Cytulik and defenseman Gabe Goodroe for the new season. Mack Hollis also returned after suffering a season-ending concussion during the 2014-2015 season. Donning throwback uniforms and a new anniversary logo, the Rhinos started their season in California where they split the series with the Valencia Flyers and earned an overtime win against the Long Beach Bombers. The Texas team then returned to the Sun City where they won the home opener against Wichita, but dropped the following two games. The losing streak continued when the Superior Roughriders swept the Rhinos at home for the first-time franchise history. El Paso went back on the road to California for a second split series against Long Beach and Valencia and lost all three games. Before reaching eleven games, the losing streak was halted when the Rhinos beat Wichita, 6-3, in the final game of the series in Kansas. When the Rhinos returned home for two consecutive home series, the Dallas Snipers took the first game, however El Paso won the following two and swept the Tulsa Oilers the next weekend. 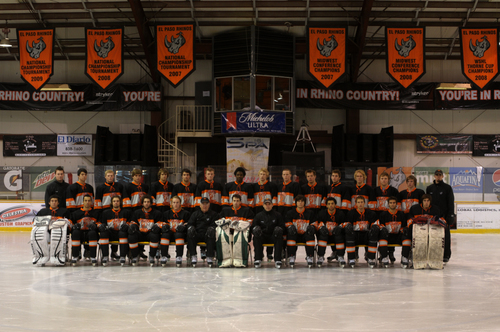 The Rhinos headed into the annual WSHL Shootout with a five-game win streak. After wins over Cheyenne, Seattle, Las Vegas and Phoenix, the Rhinos finished the Showcase with an undefeated record, something that was not even done during the season that the Rhinos won the National Championship. The second half of the season, unfortunately, got off to a rocky start when the Rhinos were swept by the Springfield Express and Oklahoma City Blazers in their first two away series of 2016. Bouncing back quickly, El Paso won their next four series. The Blazers and the Express, however, halted the series win streak and the Rhinos ended the regular season with a loss. Despite 23 losses on the regular season, the team still managed to make it to the playoffs. The Rhinos capitalized on their home-ice advantage in the first round, sweeping the Tulsa Oilers, 5-3 in game one, and 4-3 in game two. They then traveled to Oklahoma City where the season ended with two losses to the Blazers in the division semi-final series. With 27 wins and 25 losses, the Rhinos earned their worst record in franchise history, but avoided a losing season and earned fourth place in the Midwestern Division. Continuing the legacy, Connor Beaudet, Petr Ceslik, Kyle Keeder, Jakub Husa, Bryton Tomko, Mack Hollis, Gabe Goodroe, and Jorge Duenas all committed to play hockey at a higher level. Connor Beaudet, the Rhinos leading scorer, joined the Wentworth Institute of Technology for the 2016-2017 season. Deemed the El Paso’s most reliable and consistent player, he racked up a total of 67 regular-season points, and another four in the Rhinos’ post-season. Second to Beaudet in scoring, Petr Ceslik posted 64 points which helped him earn a spot on Poland’s Orik Opole’s hockey team for the 2016-2017 season. Arguably the Rhinos’ most physical forward, Bryton Tomko started his collegiate hockey career with Marian University. With 20 points and 10 assists, the 6’1 forward was ranked eighth in scoring in the Rhinos’ roster. Kyle Keeder joined the Western Michigan Hockey Club for the 2016-2017 season after earning 29 points for the Rhinos, playing both as a forward and defenseman throughout the season. Fellow defenseman, Jakub Husa, ranked seventh in scoring on the Rhino roster with 26 points. Husa headed back home to the Czech Republic for a spot on the HC Benátky nad Jizerou roster for the 2016-2017 season. Mack Hollis, Gabe Goodroe, Angel Sanca, Austin Grawbarger and Jorge Duenas decided to return to El Paso to play for the UTEP Hockey Club, an American Colligate Hockey Association (ACHA) Division II club team that was started in 2015. 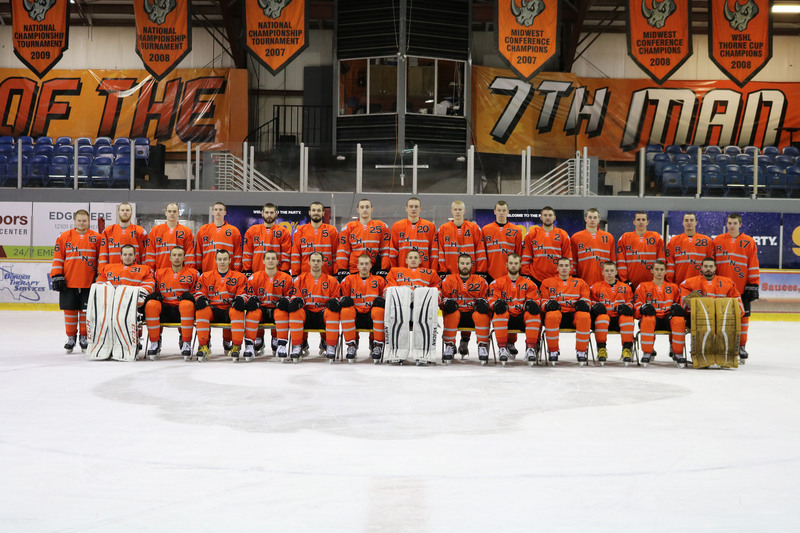 The Rhino alumni, including Lukas Znosko, Alek Lazarski, and Jeramy Rezaeepour from the Rhinos’ 2014-15 roster, helped UTEP win the 2017 Texas Collegiate Hockey Conference championship. The team started off the season by signing several players from the NA3HL’s Atlanta Capitals who would be instrumental in the Rhinos’ success throughout the year. Defenseman Riley Hummitch, and forwards Evan Camba, Drake Cartwright, Alex Johanson, and Arturas Laukaitis all played in Atlanta before committing to the Rhinos in 2016. Later in the season, the Rhinos would eventually ink former Capital Phil Pugliese. The former Atlanta players along with English defenseman Simon Hobbis, Canadian forward Chaseton Sare, and Canadian goalie, Tymen Edelkoort III were top contributors to the team’s 52-38-14 record. The Rhinos got off to a strong start, winning their first 12 games with sweeps of the Arizona Hawks, San Diego Sabers, Dallas Snipers and Ontario Avalanche. Shortly thereafter, the Springfield Express handed the Rhinos their first two losses in Missouri and Wichita earned a win over El Paso in the Sun City the following weekend. The Rhinos swept Tulsa and Phoenix before suffering two more losses to the Valencia flyers during their only December home series. Rounding out the first half of their season with two wins and two losses at the annual Las Vegas Showcase, the team shutout the Idaho Steelheads and topped the Southern Oregon Spartans but lost to the Colorado Eagles and the Casper Coyotes. Heading into January with seven losses, the Rhinos were eager to improve their record as they started the new year. They scored 19 goals in three games against the Dallas Snipers but were quickly tamed when they dropped a game to the Long Beach Bombers in only their second series back. The next weekend, the Texas team won two games in Oklahoma City before returning to El Paso only to fall twice to the Blazers a weekend later. El Paso went on to sweep the Oilers and the Express before being swept by the Wichita Thunder in their final regular-season series. Just before playoffs, the franchise announced that former Rhino and Worcester State alum Vinny Bohn would become the Assistant Coach and help coach the team into the post-season. Unfortunately for Bohn and the Rhinos, the team’s post-season run was not as long as the Rhinos preferred. The Rhinos dropped their first playoff game to the Springfield Express, 5-4, before winning the final two games of the series to earn entry to the third round of playoffs. The following weekend, the Rhinos’ season ended when they were swept by the Wichita Thunder who went on to become the 2017 Thorne Cup Champions. Despite not having the season ending the franchise hoped for, several players had notable statistics at the end of the 2016-17 season. Forward Chaseton Sare led the team in points and goals and was also among the WSHL’s top four scoring leaders. With 108 points, Sare surpassed Marcus Wilhite for the Franchise’s All-Time Points per Season record. Sixteen points behind Sare, Alex Johanson ranked second on the team and ninth in the League in scoring with 42 goals and 50 assists for a total of 92 points in 51 games. Arturas Laukaitis, who briefly left the Rhinos midseason to play for Lithuania in the World Junior Championships, finished the season with 40 goals, 33 assists, and 73 points in only 38 games. Defenseman Simon Hobbis rounded out the team’s top five scoring leaders with 47 points on the season. Finally, Tymen Edelkoort earned 25 wins, seven shutouts, and a 0.937 save percentage in 31 games. Following the season, defenseman Simon Hobbis and forward Drake Cartwright headed to play at the University of Central Oklahoma. While playing under former Rhino Captain and UCO Assistant Coach Michael Rivera, Hobbis and Cartwright helped the Bronchos win the 2018 WCHL Championship, the team’s third League title in the past three years. Alex Johanson also continued his hockey career, playing at Trine University where he totaled 8 points in 25 games. Arturas Laukaitis moved up to the NAHL where he played most of the season with the Minnesota Magicians before again returning to Lithuania to play in the World Championship tournament. Fellow Rhinos Colby Haugen, Phil Pugliese, JC Dubecky, Chaseton Sare, Jayden Ritchie, Jake Kopinski, Ty Erramouspe all signed with El Paso for the 2017-18 season. The summer of 2017 saw the announcement of the Rhinos’ installment of the RapidShot Hockey Training System, a training program used by some of the nation’s top professional and college hockey programs like the Pittsburgh Penguins and the University of Notre Dame. The shot system is designed to help players improve reception, reaction time as well as shot accuracy and speed. 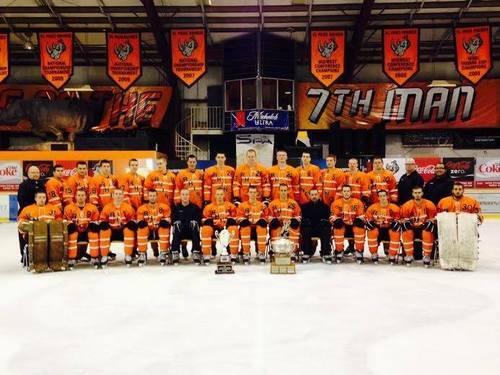 With Rhino alumni Jayden Ritchie, Phil Pugliese, Chaseton Sare, Colby Haugen, JC Dubecky, Jake Kopinski, and Ty Erramouspe returning for another season of Rhino Hockey, the franchise was confident in its ability to bring home the Thorne Cup from the start. That feeling was justified when the Rhinos opened the season with 24 goals against the Dallas Snipers in their first series. The momentum continued as the team impressively racked up 27 wins, with no losses, before the midpoint of the season. At the Western States Shootout, however, the Idaho IceCats halted the Rhinos’ win streak when Russell Harren slipped one past Krasanovsky with only 1.4 seconds left in regulation. Looking for redemption, the Rhinos pulled out wins over the Ogden Mustangs and Long Beach Bombers in the final two games. Following the Shootout, the franchise also announced that they would host the 2018 Thorne Cup. After the holiday break and the exciting announcement, El Paso headed to Wichita where they posted 30 goals over the three games. Despite a strong start to the second half of the season, the Rhinos’ momentum was stopped again the following weekend when the dropped the first game to the Blazers in Oklahoma City. El Paso bounced back immediately winning the final two games of the series. 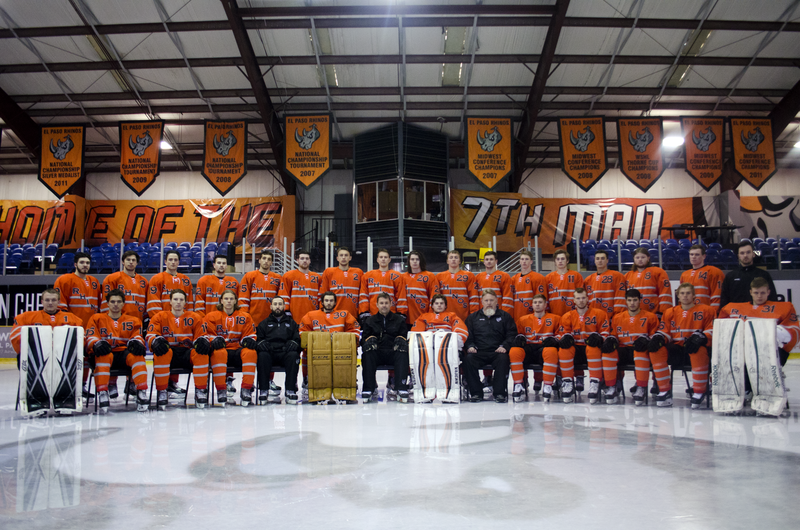 They also went on to win every remaining regular season game, giving them a record of 49-1-1, the best regular season record in WSHL history. After being two games shy of a perfect season, the Rhinos’ Thorne Cup run got off to a rough start despite being the host team. El Paso dropped their first Round Robin game 4-1 to the Long Beach Bombers and the following night fell to the Oklahoma City Blazers, 4-3, in their second Round Robin game. The tables turned on Friday, however, when the Rhinos squeaked by the Utah Outliers to land themselves in the Thorne Cup semi-finals where they shutout the Idaho IceCats. In a thrilling final against the Ogden Mustangs, Nikita Pintusov’s tie-breaking goal with only 2:10 left in regulation gave the franchise their third Thorne Cup. El Paso’s Thorne Cup push was possible because of the roster’s talent and depth. The offense posted 405 goals while the defense only allowed 63 throughout the season. Former Valencia Flyer Jakob Kranabetter was added to the Rhino roster late, but Rhino Country would be where the forward became the WSHL’s All-Time Points and All-Time Assists Leader. He totaled 239 assists and 351 points in four seasons in the WSHL. He also finished his junior career ranked fourth in points in the League for the season. Austin Simpson also greatly contributed to El Paso’s offensive success, ending the season with 98 points in 50 games played. Ranked thirteenth in League for points, Simpson’s 38 goals and 60 assists also made him the team’s leading scorer for the season. Only two points behind his fellow forward, Chaseton Sare’s 96 points included 51 goals, earning him the fourteenth spot on the League’s point leaderboard. Phil Pugliese also posted a notable 81 points in his final season as a Rhino. Defensively, the Rhinos were led by netminder Filip Krasanovsky. In 37 games played, he had an impressive 93% save percentage and a goals against average of only 1.35 a game. He also posted 12 shutouts in 35 wins and two losses. Canadian goaltender Kayden Pickles, however, became the defensive backbone of the team during the Thorne Cup finals. After the Rhinos lost the first two games of the tournament, Pickles started in the final round robin game against the Utah Outliers. His win earned him a start in the semi-finals where he shutout the Idaho IceCats. Finally, Pickles held the Mustangs to only two goals in the championship game, allowing the Rhinos to hoist their third Thorne Cup.